Waste disposal assistance offered by the resorts to the local neighbouring islands. A new Thilafushi recycling project. A proposed Baa Atoll environmental awareness day, to include all the resorts and local island communities. Trudy “the mosquito lady” is to visit, as part of the education program for local islands. Various engineering ideas to reduce resort power consumption (including the harnessing of heat from the island generators to provide hot water, and the installation of motion detectors & thermostats). The sustainability of resort recreational fishing activities – restriction of fishing sites; closer species/size monitoring of caught fish; establishing of mooring buoys. 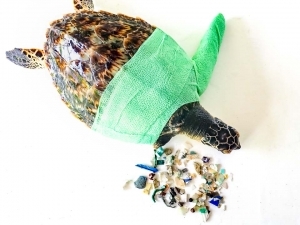 A proposed review of known turtle nesting sites – on resorts, local islands and uninhabited islands. Launching the new ‘Olive Ridley Project’ Facebook page to collect and share information about ghost nets. A review of the BAARU points of discussion, including waste disposal and recreational fishing. 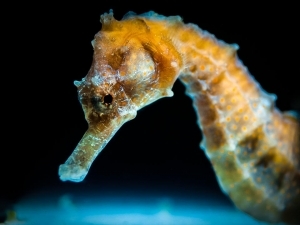 The Manta Trust – goals of the organisation, and the results achieved in the past ten years. All the resorts have been invited to submit photographs for identification. Our turtle identification and monitoring programme – how to successfully take photographs to enable identification of an individual. Reaching out to other organisations – the Maldives Environmental Protection Agency, the Maldives Marine Research Centre, and UNESCO (The United Nations Educational, Scientific and Cultural Organization). [A] Whale Sharks Workshop took place on 5 July in Dighura (South Ari atoll) with 19 participants mainly from dive schools and recreational teams of the Ari Atoll resorts. The meeting was organized by Richard Rees, managing director of the Maldives Whale Shark Research Program (MWSRP) and Rifaee Rasheed, Marine Projects Officer for IUCN (International Union for Conservation of Nature). They explained about the biology and behaviour of the animals, followed by tips on how best to organise excursions to see them in the wild. It is estimated that whale sharks first appeared in the earth’s oceans some 220 million years before the dinosaurs, and it has been reported that a female can have 300 embryos in its uterus at any one time, at various stages of development. 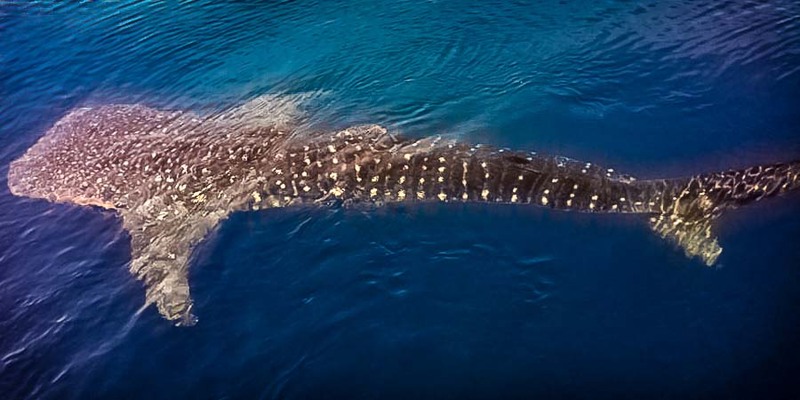 Considered as ‘Vulnerable to Extinction’ by the IUCN, MWSRP indicated that over 67 per cent of the whale sharks within the Maldives have at some point been victim to a boat strike, believed to be the highest frequency in the Indian Ocean. 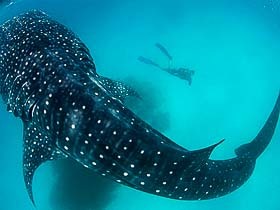 Through indirect tourism and daily boat excursions, whale sharks generate substantial financial revenue for the Maldives each year. The purpose of the workshop was to inform everyone about the rules needed to respect the whale sharks during the trips, and sharing our knowledge about these animals. By observing these best practice protocols, visitors can observe these beautiful creatures while ensuring no harm or disturbance comes to the animals, thus protecting their populations for the long term. Whale sharks, the biggest fish of the marine kingdom, are fascinating animals. Feeding exclusively on plankton but true sharks by their anatomy, they are found all around the world in tropical and temperate seas. The many warm and shallow lagoons here in the Maldives shelter a large population. Ari Atoll and Baa Atoll in particular are renowned for spotting whale sharks at virtually any time of year, particularly when groups come to feed during the western monsoon (June to November). Whale sharks are difficult animals to study due to their size (up to 18 m), because they are pelagic (spending their time out in open water) and because they can dive to very low depths (up to 1600 metres). Where are the females and large males? What size do they reach at maturity? 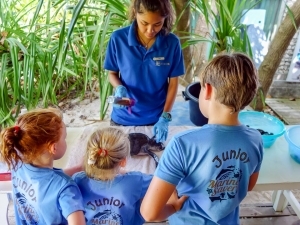 For more information about whale sharks in the Maldives, you can visit the MWSRP website here, and there are some excellent educational resources, including presentations and detailed classroom notes available at the Travel Foundation website here. 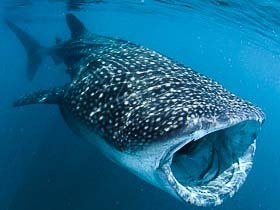 Whale sharks reproduce very slowly, although the exact gestation period is not yet known. Although a whale shark mother may have a veritable conveyor belt of offspring, many of these small and defenceless young will not survive to reach sexual maturity to themselves reproduce (maturity may not be reached for thirty years). For this reason it is vital that whale sharks are protected, as any impact that tourism may be having on the whale shark population here in Maldives is still not known. 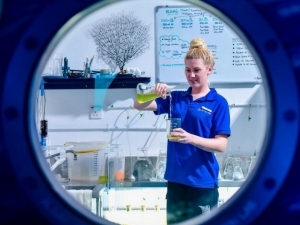 The MWSRP team lists guidelines on their website (similar to those used in Western Australia) and proposes ‘best practice’ recommendations for tour operators and resorts to prevent overcrowding. Some of the guidelines include limiting the number of boats to one per shark, and maintaining distance of 20 m between shark/boat and 3 m between shark/snorkeller. All workshop participants were in agreement that it is better to abort an excursion and explain the reasoning to the disappointed guests, in preference to over-crowding a single animal with the risk of disturbing or even injuring it.